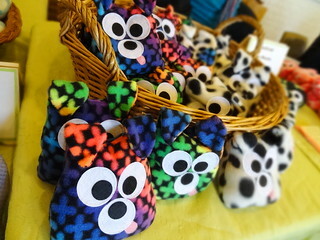 It’s that time of year again; maker’s fairs, artists markets, arts and crafts shows fill the weekend calendars. 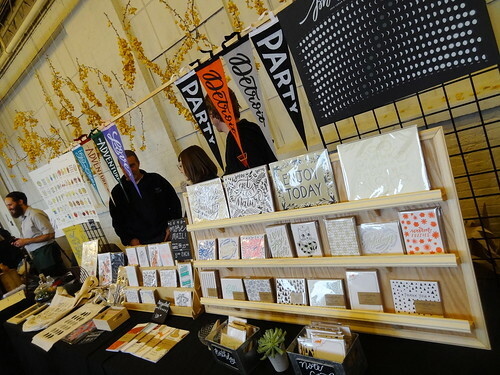 Talented folks present ideas, products and services to the public, gathered in unique venues across the urban landscape. 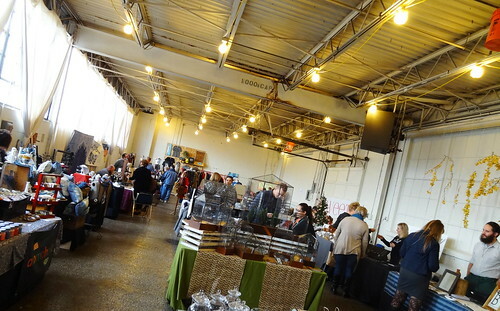 Today we are attending the 2nd Annual HLDYMRKT, a DIY Holiday Craft Market held in an old industrial building on Christopher, off Conant just south of Jos Campau; it’s certainly off the beaten path! For us, seeing the building itself is as much of a treat as what’s going on inside. The building is owned by Andy Didorosi of the Detroit Bus Company; when we saw the buses parked in the lot, we knew we were in the right place. Signs on hot pink poster board lead us to the entrance; let’s check it out. 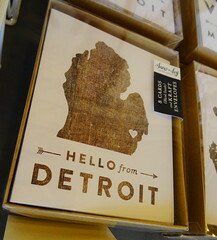 Inside we are greeted by the scent of gua bao, Asian buns stuffed with tasty fillings from the San Street food cart, shoppers carry steaming cups of coffee from Red Hook and nibble on treats from Pinwheel Bakery. 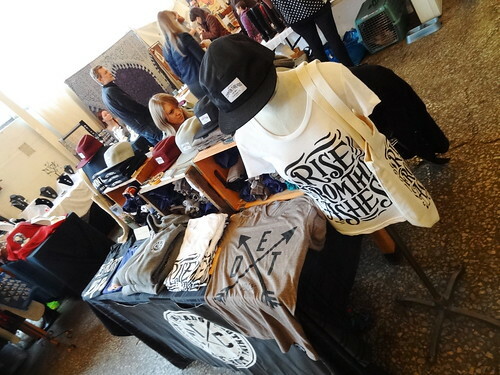 The space is long and narrow, daylight fills the room, rows of vendors await us. The group gathered today are independent small businesses; some have a brick and mortar location, others do not. 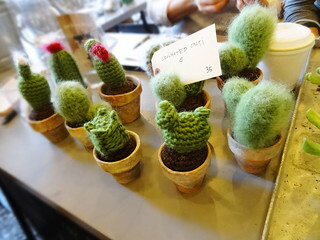 As we stroll the aisles we are excited to see a lot of things we’ve never seen before; Pot & Box offers a DIY terrarium bar, they are also selling crocheted cacti in tiny pots that look exactly like the real thing. I still send hand written notes and cards, I love checking out paper goods, Snow & Ivy has some great designs, I’m stocking up. SWEET has a variety of, well, sweets, artisan marshmallows being the main draw; vanilla bean, double chocolate, banana bourbon caramel and mango picante are just a few of the flavors; the snowflake s’mores look delicious. Vintage clothes from Jenstyle Vintage hang on racks, fabric items such as stuffed animals, hot and cold packs, hand-dyed pillows and tea towels make nice gifts. 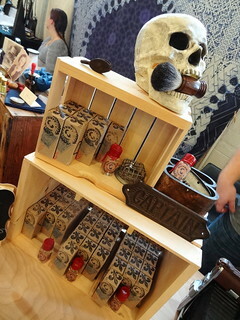 Beards are in, so are men’s grooming products such as beard oil, pomade, mustache wax, combs and brushes. 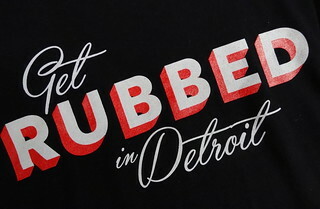 Detroit is represented in a number of t-shirt designs and posters. 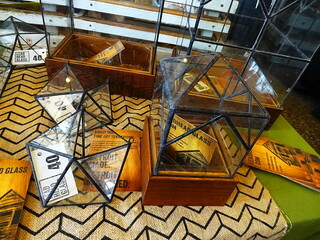 The terrariums from Leadhead Glass are stunning, each is made from reclaimed raw materials from abandoned and deconstructed homes in Detroit, pretty cool! 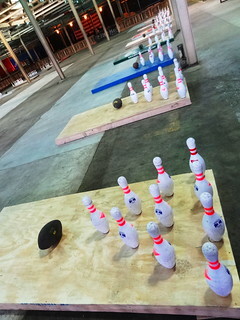 Some friends tell us we need to go next door and check out the Fowling Alley……Wait, what?? We’re curious what the buzz is all about so we head over. 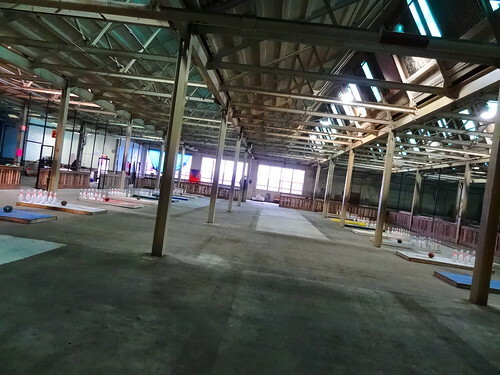 First, let me say, the space is huge; 34,000 sq ft huge! 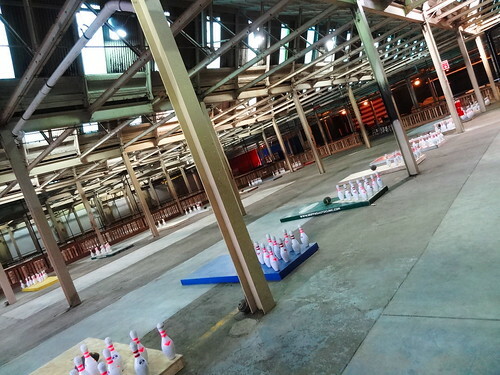 At first it’s hard to comprehend; to our left is a series of “alley’s”, wooden platforms sit on the floor, bowling pins are set up on one end and a football rests near by, the area is sort of enclosed by nets and fencing. 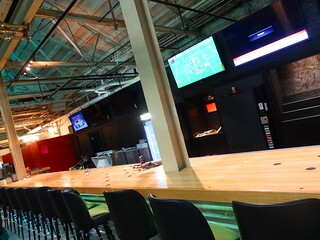 To the right is a mile-long bar, ok, it’s not really a mile long, but you get the picture; tall stools are pulled up to the bar awaiting their first customers, the top is constructed from old bowling lanes, clever. 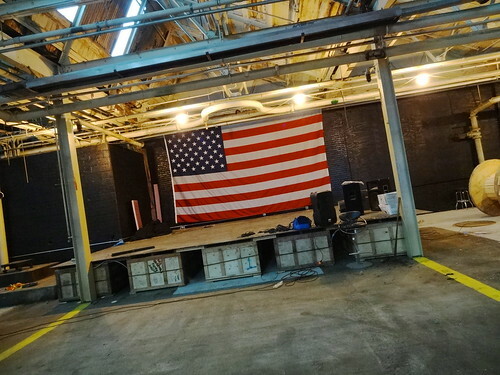 Far in the back a gigantic American flag acts as a backdrop for a stage platform, the rest of the square footage is filled in with industrial-size spools acting as tables in the soon-to-be biergarten……it’s a lot to take in! The building itself is nearly 100 years old, the ceiling a combination of metal beams with a saw-tooth skylight roof; light filters through green panels. After doing some reading I discovered this was home to the Gear Grinding Machine Co. in 1925, Dana Corp purchased the building after the war, it was then known as the Con-Vel Division Plant where the Rzeppa constant velocity u-joint was manufactured; gotta love that Detroit history. People are busy with tasks as they get ready to open for business, the owner, Chris Hutt is nice enough to explain what’s going on and most importantly, what FOWLING is. Chris actually invented the sport himself along with a few friends; a combination of horseshoes, bowling and football, he guarantees it’s a good time. 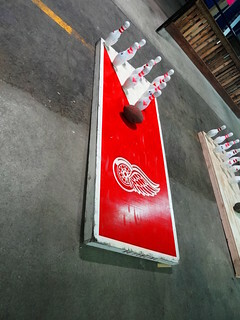 Two arrangements of 10 bowling pins are set up on flat boards 48 ft apart from each other, fowlers take turns throwing a football from their board to the opposition’s board, each trying to knock down their opponents pins first…. sounds fun to me! 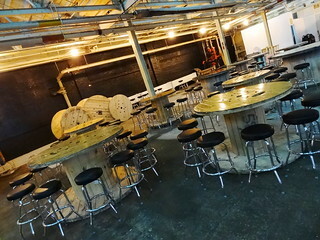 From fowling to live music, cocktails and mystery beer, The Fowling Warehouse promises to be a good time. 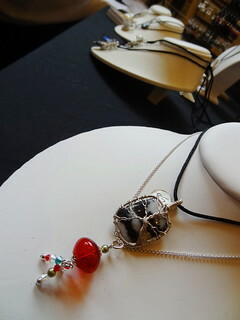 Keep checking their Facebook page for the opening. There is no shortage of delicious food in Hamtramck, but today we had our mind set on a particular place, Rubbed, a sandwich and charcuterie shop on Michigan Ave. 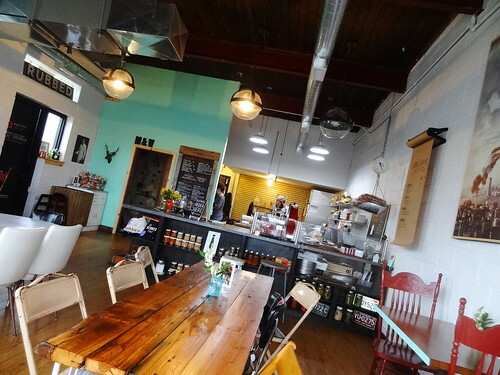 The small but quaint dining spot offers a tasty variety of cured and preserved meats, cheeses and accouterments available on a sandwich or charcuterie board; it smells amazing when you walk in the door. The interior has a retro feel; wood floor, vintage globe lights, an assortment of table and chairs, make the completely open space feel homey. Shelves by the counter are stacked with preserved vegetables, Rubbed t-shirts and old license plates. A chalkboard menu is placed near the register, we walk over and begin the decision-making process. Soup and sandwich sound good, we place our order and have a seat by the front windows overlooking all of the activities on Michigan Avenue. We help ourselves to cucumber water and look around, charcuterie board menus are written on plain brown paper near the counter, they all sound delicious; meats, cheeses, breads, pickles, olives, nuts…..Our food arrives, it looks and smells wonderful. I dip into the steaming hot bowl of mushroom soup, well seasoned, packed with mushrooms and a fair amount of bacon, it’s delectable. Kris stabs a potato from the dill and red skin salad and nods his head in approval. 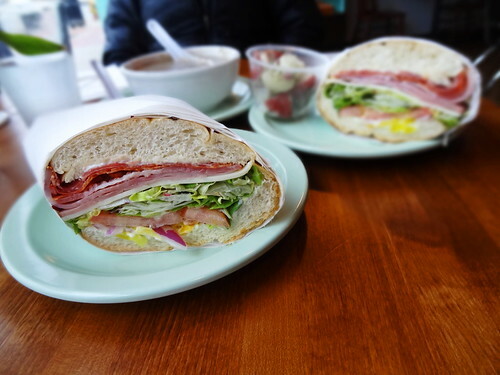 The Little Italy sandwich is huge, certainly big enough for two, it comes wrapped in butchers paper and cut in half. The bread is the perfect combo of crisp and tender, stacked with capicola, mortadella, pepperoni, provolone, lettuce, tomato, red onion, banana peppers and mayo it is quite a mouthful, a scrumptious one at that.We eat until we have polished off every last crumb, the meal yummy and satisfying. Be sure and check out their monthly dinner series, maybe we’ll see ya there! Rubbed is now closed but be sure and check out Ima, the new restaurant in the space.